Biker Information Guide - It's that time of year! Home / /It’s that time of year! Know the signs and how to prevent it. Sweat glands no longer producing any sweat, Arms and face completely dry, Blurred vision, Dizzy feeling, hard to swallow and weakness in muscles. Keep the direct sun off of your skin. Wear a light colored long sleeve shirt over your arms and a helmet or a bandanna on your head. Exposing your skin to sun and wind is a double whammy that only increases fluid loss from your body. Pour water over your shirt. A good way to create a natural evap cooler for your body is to pour water over your arms, neck and the front of your shirt. While you are riding this provides a cooling sensation for your body. Drink LOTS of water. You should be drinking at least 8 ounces of water every hour when riding and probably more. Sports drinks like Gatorade are also good as they replenish needed electrolytes as well as fluid. Drink water BEFORE you are thirsty. Once you have gotten to the point that your mouth is bone dry, you are on your way to dehydration. Take in more fluid than you are losing. If you are not making a trip to bathroom regularly, or your urine is a dark color, this means you are not getting enough liquids in your body. A good idea for keeping you hydrated while you are riding is a Camelback Hydration System. This is a 70 ounce pack that fits on your back with a tube that comes around for you to drink water while you are riding. Symptoms of dehydration: Thirst, Dry Mouth, Dry Tongue, Fatigue, Dark Colored Urine, Infrequent Urination, Dry Skin, Rapid Pulse, Dizziness, Blurred Vision. Covering Your Head is a good way to prolong your ride in the heat. Mrs. C. and I have found that wearing a good helmet is a great way to combat dehydration. You would think it would be hotter, but it has the opposite affect in keeping you cooler. A lot of the water leaves your body through your head. 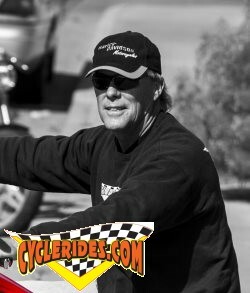 If it is covered, it will greatly prolong the amount of miles that you can ride without water intake.This is a serious illness and happens a lot in Arizona. Be aware.